Other Distinguishing Features: The Atlantean has green, scaly skin and is missing his left lower leg which is replaced with a hook. When on the surface, he wears a bowl of water around his head to breathe. 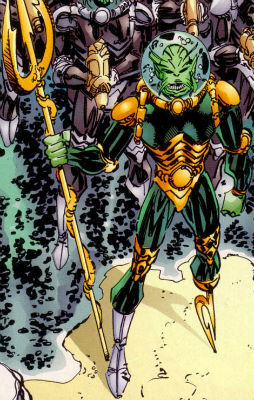 Impervious Rex, known as the Atlantean, sought to extend his mammoth undersea kingdom to the surface world and led his Atlantean army into the United States. The Special Operations Strikeforce met them at the shore where they prepared for battle. This fight never came to be as explosive decompression got the better of the invading army, leaving the Atlantean helpless and forced to surrender. After spending some years in the custody of the United States, the Atlantean broke loose once he had learned that Thor had led his army of Gods to cast out his people of Atlantis. He commanded an army of the monstrous Grokk to fend off the Gods, enabling the Atlantean to keep Atlantis away from events on the surface world. This was a decision prompted by the various alien invasions that had occurred as well as the conquest of the planet by CyberFace. The Atlantean opted to use the gigantic Grokk race to burrow tunnels through the Earth to link every body of water on the planet, allowing easier access for his empire. The tunnels endangered the very structure of the planet and Rex Dexter planned to bring him down. Before Rex could get his opportunity, Mako assassinated the king by biting off his head.